Getting a drivers license used to be an highly anticipated rite of passage. But more and more teenagers are waiting past the age of 16 to obtain their license and the reasons for the delay may surprise you. Two researchers at the University of Michigan agree. They discovered a dramatic 30-year decline of young drivers. They also found that the fraction of young drivers with licenses was inversely proportional to web access. By itself, there’s nothing especially new about these findings. 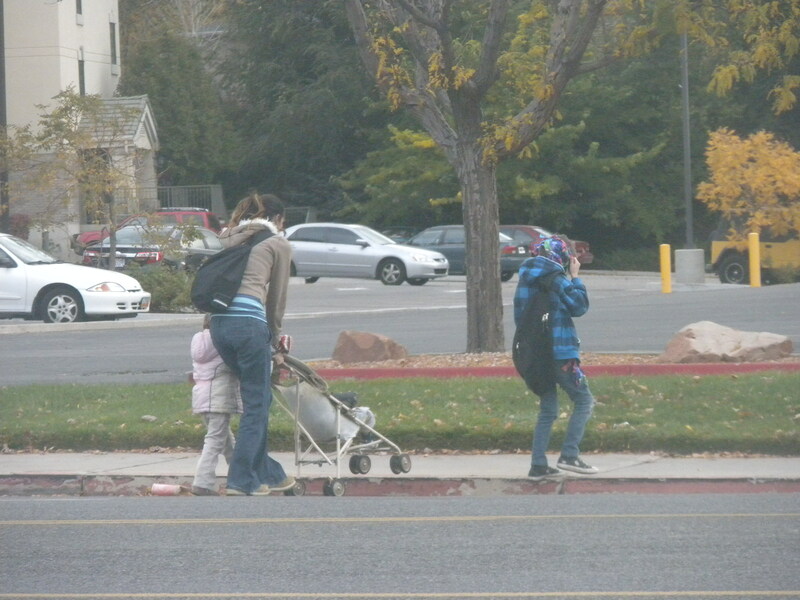 But the KSL article does illustrate how this trend is occurring in communities along the Wasatch Front. And along with the many other articles on this same topic, it further suggests a declining role for cars in our communities. Teens would rather text than drive. That’s part of a larger trend toward fewer and fewer cars. That means cities and residents need to rethink the way they plan and spend. For example, streets like the one I highlighted yesterday will become increasingly unjustifiable even when housing is built up around them. More immediately, colleges like BYU and UVU will need less parking — college students are just a tad older than the teens in the article, after all — even though skeptical residents have seen years of car increases. And in general cars will have a smaller role in cities’ futures. 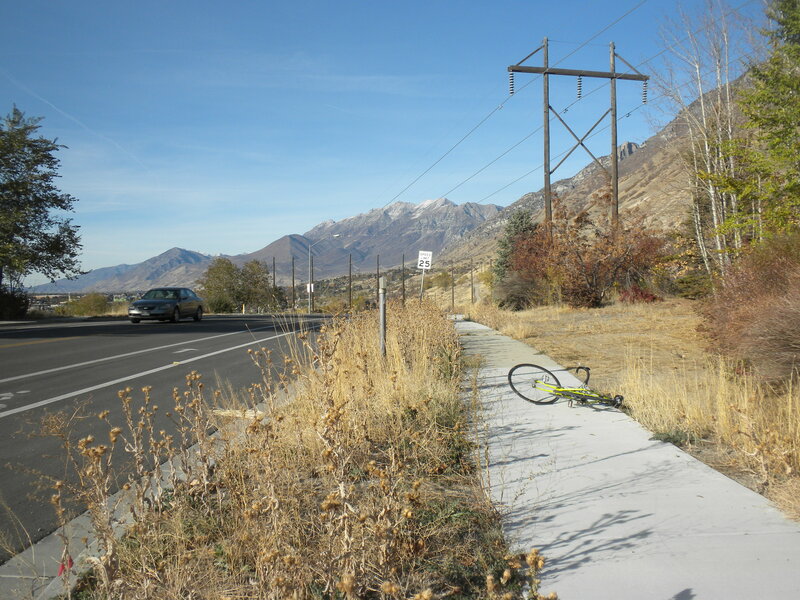 A car cuts into a bike lane in southeast Provo. Luckily, I was riding in the shoulder as this happened. There was also so little traffic that it wasn’t really a big deal. I might have done the same thing if I had been driving. But there’s a much bigger issue here than one car drifting out of its lane: why was this road designed this way in the first place? From a biking perspective, this makes little sense. The car lane and the bike lane are crammed together in the middle of a wide street with no buffer in between, while a huge shoulder goes unused. It’s unsafe and unnecessary. Parking is permitted along this street — or at least, there were no signs prohibiting it — so the obvious solution would have been to put the parking to the left of the bike lane. That approach would have placed a large protective space between bikes and cars, as well as a physical barrier if anyone ever actually parked here. Instead, however, this nonsensical shoulder becomes a de facto bike lane, the actual bike lane becomes a buffer, and when anyone parks here cyclists will be left navigating an obstacle course of opening doors and drifting cars. At very least, this bike lane could have used a small buffer zone — even one six inches to a foot wide — like those I recently saw in Barcelona. With this much space, there’s no reason to not have a buffer. Of the four proposals previously shown, the council picked the option that offers not only wider sidewalks, but some plaza areas and places for bistros to put outdoor seating. On Tuesday McGinn brought the council three tweaked alternatives to that option with costs ranging between $224,000 to $4.7 million for the ultimate remake. All dollar amounts are the very high-end estimates and don’t take into account a number of benefits that construction can bring to lower costs. Apparently some of these costs could be defrayed by having private developers — the LDS Church, for example — incorporate upgrades into current building projects. 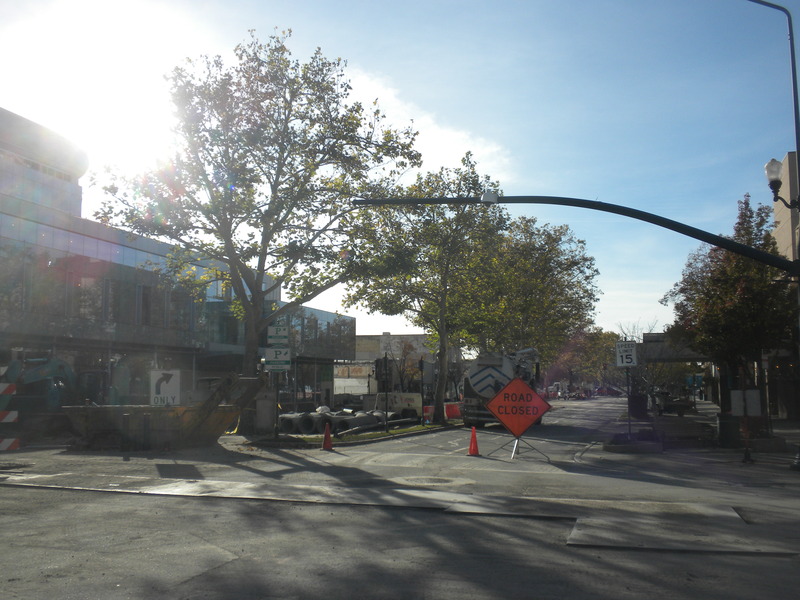 Construction on Center Street has created a unique opportunity to improve various things such as bike infrastructure and sidewalks. After debating the issue online and reading Genelle’s article, I’m inclined to agree that due to ongoing construction this is a great opportunity to improve the city. If the sidewalks and other things are gone or nearly gone already, there’s no reason not to build them back better than ever. I’m especially excited for any potential improvements to the bike infrastructure, improved outdoor dining, and rumored plazas. This area of Center Street could certainly improve, but other parts of downtown need improvement much more. Hopefully the city is thinking just as critically about investing in and improving those areas because unlike Center Street, they actively repel users. University Ave, Freedom Blvd, and 100 South all come to mind. Center Street just west of the Covey Center is another spot that fails in nearly every way. Hopefully improvements will come to this area someday. I didn’t realize until I took this picture that this street is at least seven lanes wide. That’s wider than many freeways. Second, improved sidewalks and other amenities are not, by themselves, going to bring a significant number of new people to downtown. This is more or less the argument I made last night in a kind of online debate in the Support Downtown Provo Facebook group. For the sake of time, I’m going to borrow from the comments I made last night*: the problem in downtown is an insufficient number of people. My solution to that problem is adding people via density, job creation, etc. Relatedly, there seems to be a sense among some people — including myself in the very recent past — that there is a huge pent up demand in Utah Valley, and if we could just tap into it downtown would flourish. I disagree with that assumption; if it existed, we’d already be seeing it. In other words, I’m trying to look at this in terms of supply and demand. 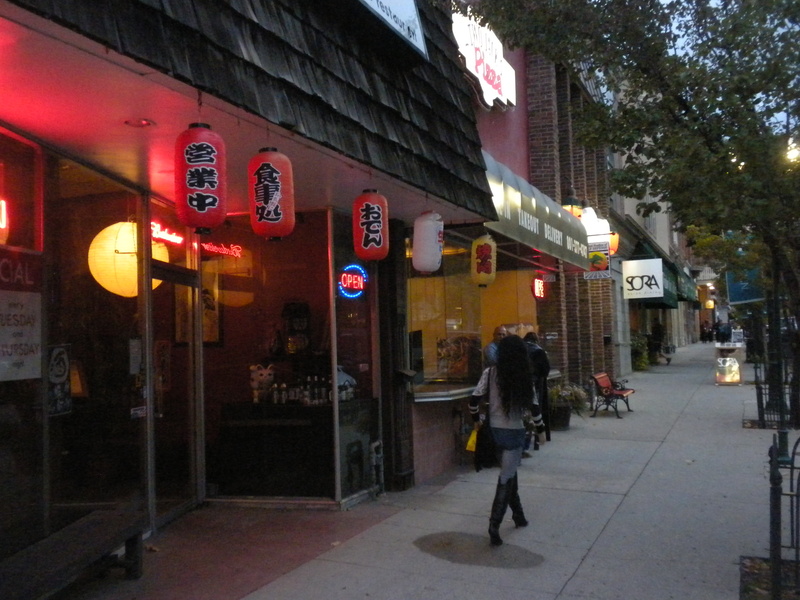 Right now there is an over supply of sidewalks space, for example, so adding more only cheapens it. And because most sidewalks in downtown tend to be empty much of the time, having more of them will just emphasize the emptiness. This large section of sidewalk is already underused. The way to fix that problem is to add density, not more sidewalks. All of that said, Genelle’s article seems to indicate that these improvements aren’t about inducing more demand for downtown space — or in other words directly incentivizing people to come out and patronize the area — so much as they’re about planning for future growth and capitalizing on a unique moment. Development is cheaper and easier right now so it makes sense to do it. In that context, they’re exciting. The next step will just be adding the people to make all of this worth it over the long run. 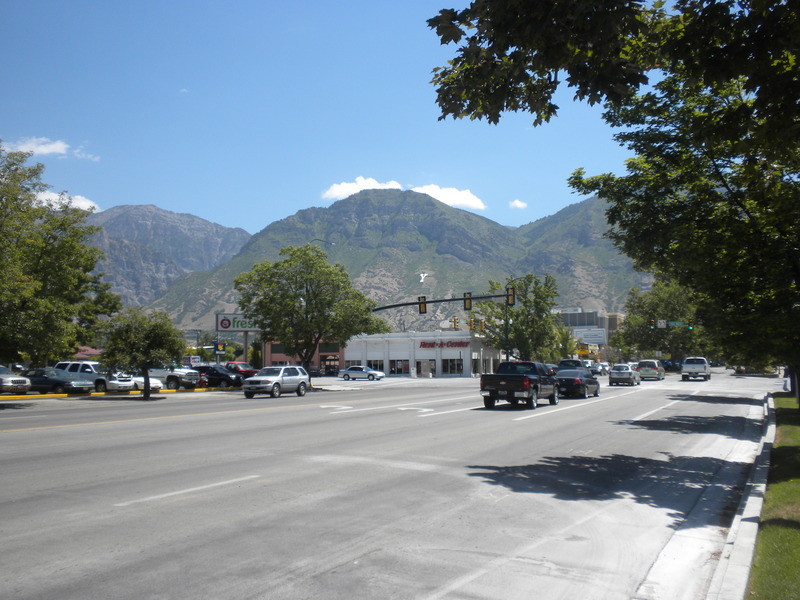 The biggest problem here isn’t bad infrastructure, it’s that there simply aren’t enough people in downtown Provo to fill the space. Hopefully coming improvements in downtown will make spaces like these better and will be coupled with increased density. *My view on this issue evolved last night as I was debating and reading about it. For what it’s worth, I’d highly recommend checking out the Facebook group where that debate took place to see other people’s excellent insights — which persuaded me — and to stay abreast of what is happening in the city. Here’s the link again. 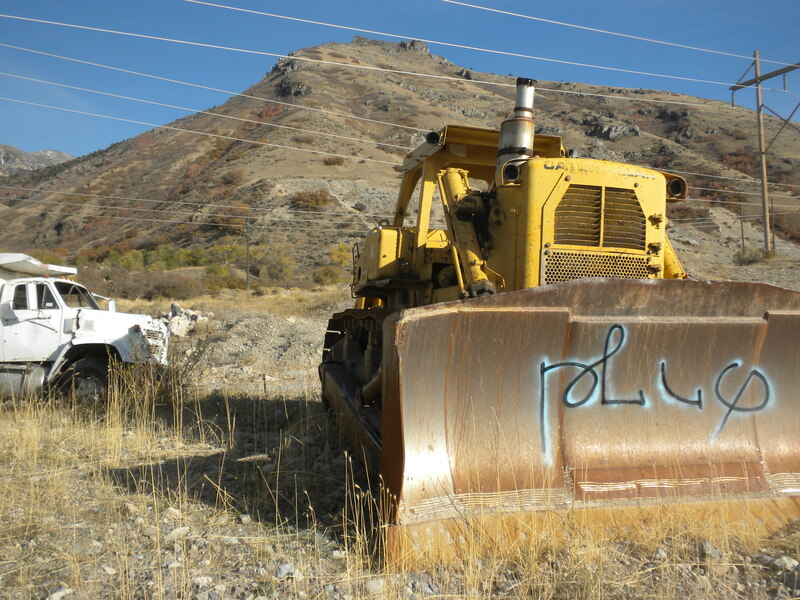 High in the hills of southeast Provo lies a subdivision that never was. 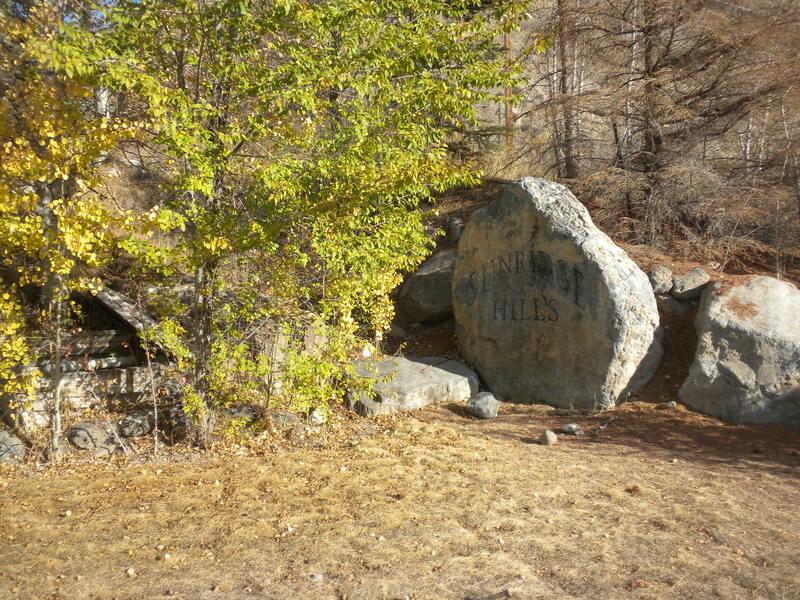 Located near the Bonneville Shoreline trailhead, Sunridge Hills apparently would have been some sort of housing development if it hadn’t stalled before it got off the ground. As it is, however, the sign in the picture below announces nothing more than itself. Sunridge Hills would have been some sort of housing development. My guess is that the recession and bursting of the housing bubble put an end to that plan. This grass died while it was still sod. 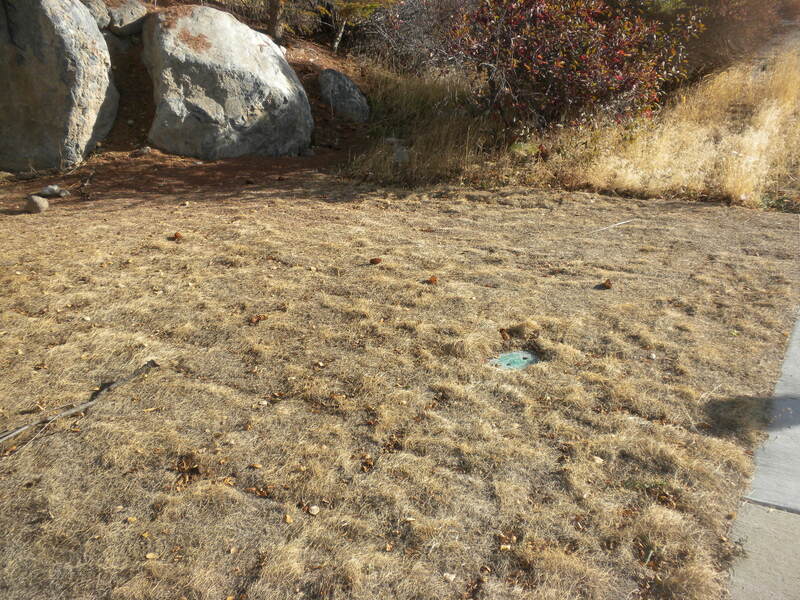 Unfortunately, the would-be developers planted trees that couldn’t handle Utah’s dry climate. When the developers stopped watering those trees, they died. 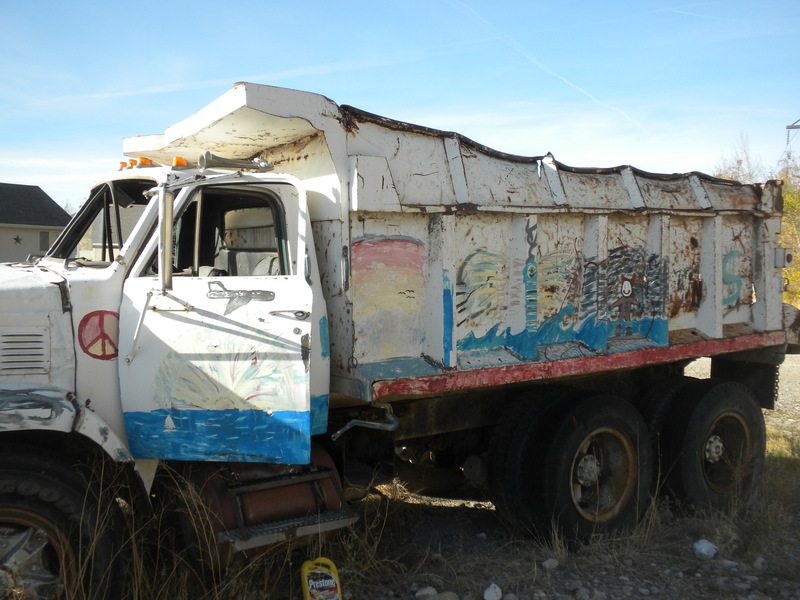 Along with dead plants and a vandalized sign, the developers also apparently abandoned this dump truck. Some enterprising young artist has since appropriated it as a canvas. All of this could have been subdivisions. 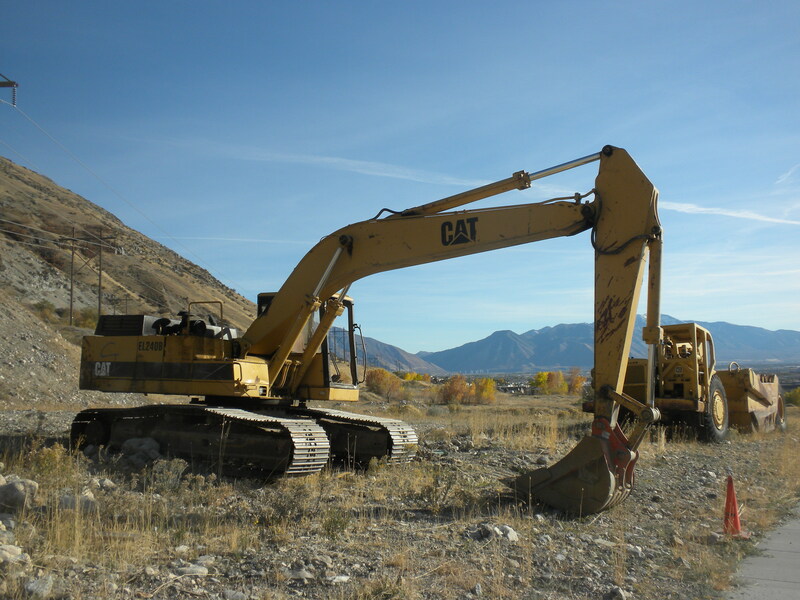 Instead, it’s a graveyard for dinosaur-like machinery. More graffiti on an abandoned tractor. The would-be developers would like to thank the taxpayers for building this road. Even though the development went bust, the community will have the pleasure of caring for this road forever. In fairness, this road does connect actual neighborhoods to the city. However, the road appears to be far larger than needed, perhaps in anticipation of the development that never was. 1. There’s a good chance this would have been poorly executed sprawl. 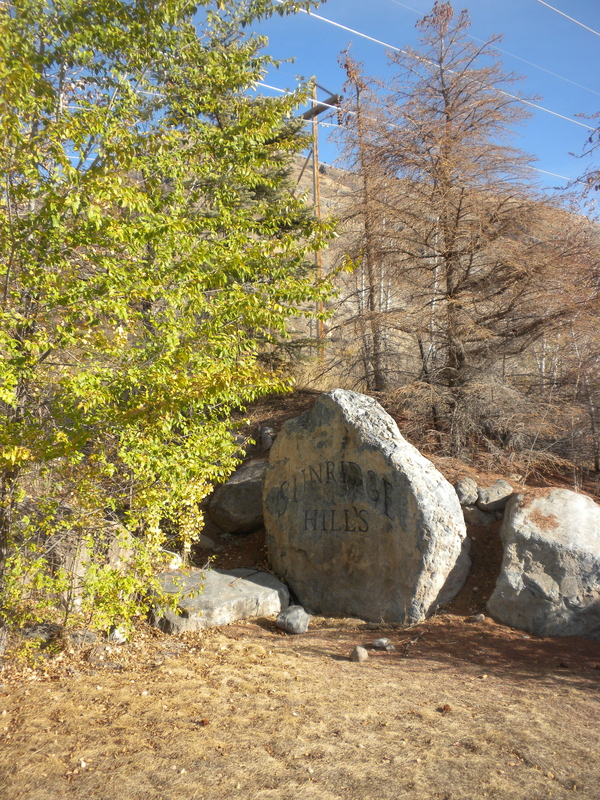 Based on the surrounding houses, as well as the location of this development on the outskirts of the city, it seems likely that Sunridge Hills was destined to have inexpensively constructed low density housing. That’s just a supposition, of course, but it seems reasonable, and unfortunate. 2. Most significantly, this project is made possible by government subsidies in the form of the road. It’s frustrating to think of taxpayer money needlessly going into the pocketbook of any private developer, but it’s even more alarming to see it happen on a failed project. In other words, every government project involves allocating resources. 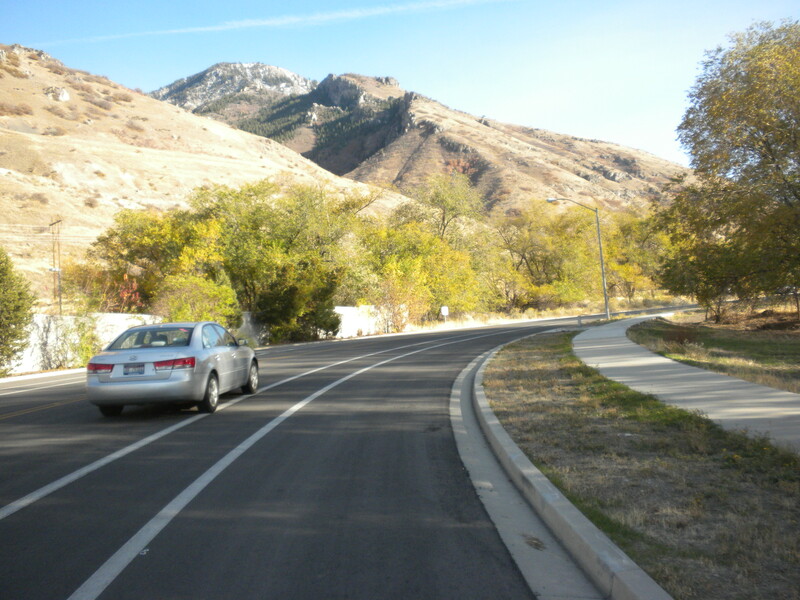 Allocating resources for this road benefits fewer people than similar allocations in denser areas. It’s less bang for the tax payers’ buck, and the problem is exacerbated by the fact that the road is designed to service homes that were never even built. 3. The recession may have stalled this sort of development, but unless cities change their attitudes about spending, roads, and development, it’s likely to resume someday. If and when that happens, tax payer money will continue to be used for underperforming projects that benefit fewer people than they should. Earlier this month, Zillow and Walk Score both released a list of top cities for trick-or-treating. All of the cities on the list are relatively big, dense places that routinely show up on all sorts of lists about great cities. In city planning and design, there’s an old saying about the “Trick-or-Treat Test.” It’s often brought up in the context in suburban home design: Can kids easily find the front door to your house, or must they poke behind the huge multi-car garage, past the parking asphalt, to ring your bell? Homes that fail this Trick-or-Treat Test aren’t exactly welcoming, and not just on Halloween. 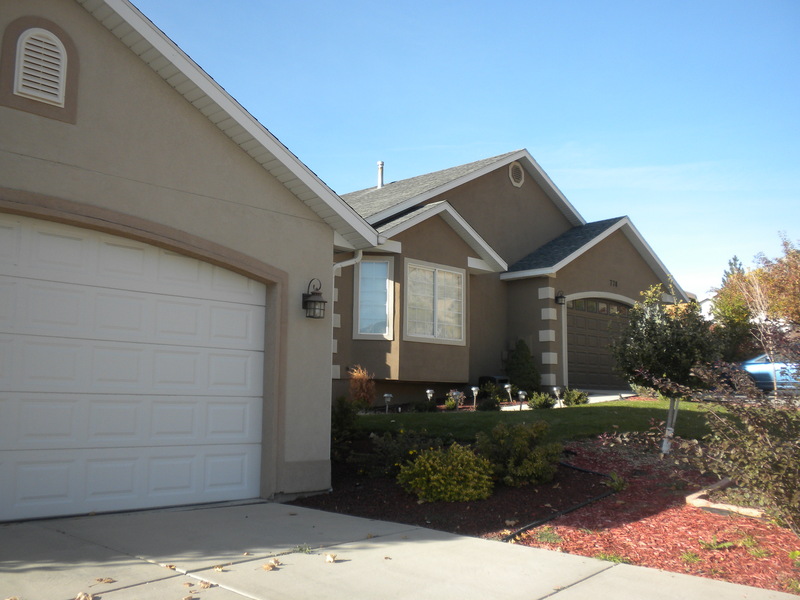 These homes in East Provo are spread out and would require trick-or-treaters to do more walking and less door knocking. Even worse, the house on the right lacks a front door. Much like the homes Toderian describes, the home’s door is off on the side and hard to access. This concept is similar to the “popsicle test” and, as Toderian goes on to note, is connected to the idea that the presence of children on the streets indicates a great neighborhood. Toderian also points out that “door density” is key for a good trick-or-treating neighborhood. The idea, he explains, is for kids to maximize the number of doors they can access in a given amount of time. In that light, denser neighborhoods with more dwellings clearly have the advantage over sprawling communities. Toderian, also criticizes some of the more contrived “safe trick-or-treating environments” such as mall events or trunk-or-treats as evidence of poorly designed neighborhoods. 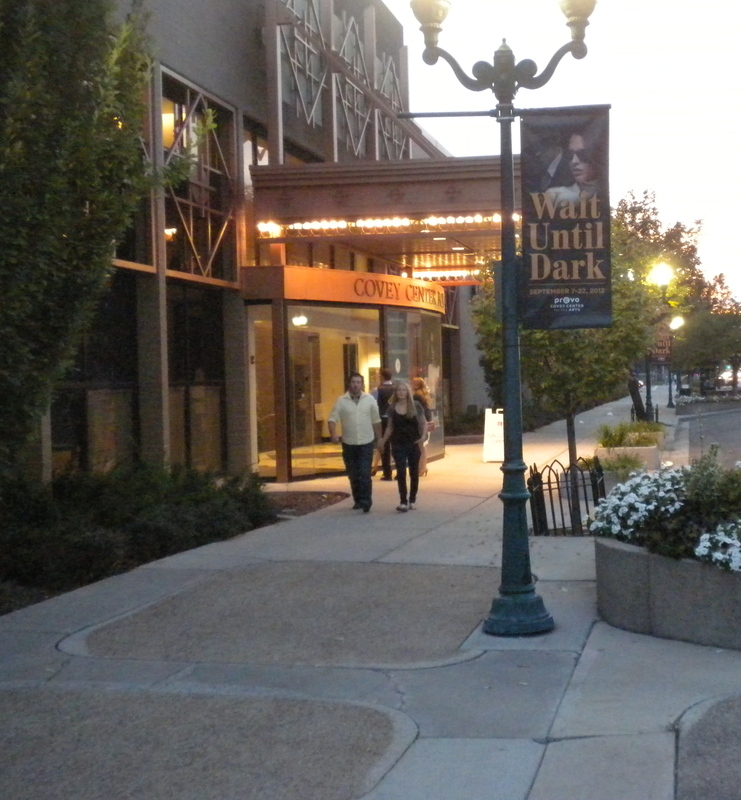 Cities that are essentially walkable, pass any Trick-or-Treat Test. They are also more resilient, flexible, healthy, green, and economically successful neighbourhoods and cities. Why is Halloween my favourite holiday? Because it reminds us once a year what great neighbourhoods are made of. 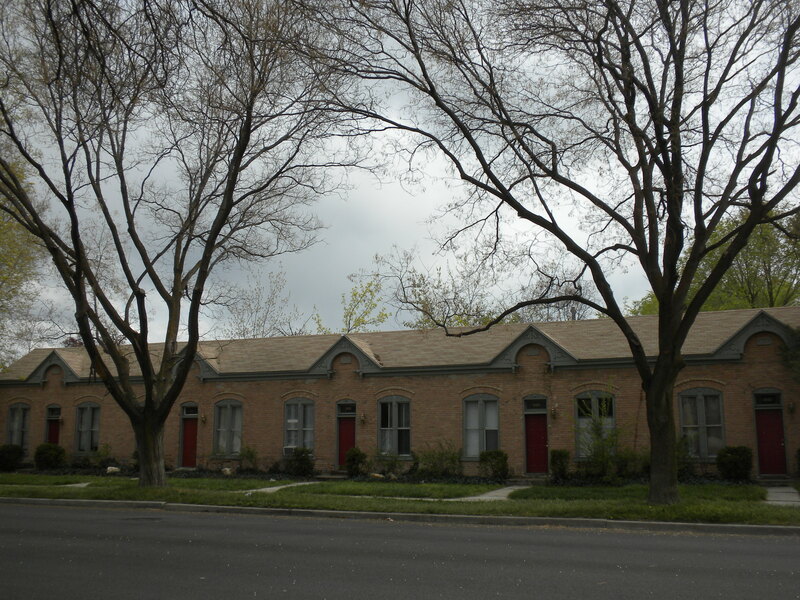 Compared to the homes in the earlier picture, these historic apartments offer a much greater return on time invested for treat-or-treaters because there are more doors to knock on in a smaller amount of space. If this blog accomplishes nothing else, I at least hope it persuades people to embrace, rather than resist, density. A proposed mixed use building would add some density to downtown. However, communities looking to make significant progress will need a lot more than one medium-sized building occasionally going up. But density also means the museum, art galleries, film festivals, Nuit Blanche and major league sports. It includes some of the best universities in the world, not to mention countless restaurants, shops and amenities, everything from skating rinks to pools to…. Density generates economic activity, i.e. jobs and wealth. And in the 21st century, as never before, the business of the world is transacted in large urban centres. In fact, density is what will save the city and the Greater Toronto Area and enable its 5.5 million inhabitants to prosper in the decades ahead. The alternative — sprawl — is catastrophically wrong. Not only is sprawl environmentally unsustainable, it’s economically ruinous. As I have said before, it is easy to mistake shiny new subdivisions for prosperity. New suburban buildings and new wide roads look great when first built. But over time, the strain of that type of development creates a significant burden on a city or county treasury. In North Carolina, a study by the City of Charlotte found that a fire station in a low-density neighborhood with disconnected streets serves one-quarter the number of households and at four times the cost of an otherwise identical fire station in a less spread-out and more connected neighborhood. Another study in Champaign, Ill., by the respected consulting firm TischlerBise, found that growing within the city’s current urban service area would generate a tax surplus of $33 million, while sprawling beyond it would put a $20 million hole in the city’s budget. Fulton goes on to mention, as many others have before, that sprawl is a contributing factor in the recent spate of California city bankruptcies. But in any case, the point here is that density has an array of positive impacts on a community. And though any change is hard, communities that embrace density are far more likely to see positive, enriching progress in the future. On Friday, I wrote that poorly designed streets often produce one of two results: accidents or constant monitoring. We’ve seen both lately along the Wasatch Front, unfortunately. You can blame people for accidents. Or you can blame bad design. That’s where, increasingly, planners trying to prevent pedestrian collisions are going. Rather than put the onus on pedestrians to stay out of the way of cars, planners and engineers are considering how to make streets and intersections safer. “One of the best investments we make is in the design of the road,” says ICBC road-safety manager Sonny Senghera, as he reels off a list of improvements that the provincial insurance agency encourages and even contributes money to in B.C. cities. A couple prepares to run through traffic. Clearly that’s a bad idea, but good street design de-incentivizes danger behavior and rewards safe choices. The article goes on to explain things such as lights with built in timers, lower speed limits, more crosswalks and other things. There’s more information than I want to quote directly here, so click over for the whole article. In light of the article, what’s baffling is that communities continue to tolerate — or worse, build — dangerous streets. Both the problems and the solutions are intuitive and in most cases simple. The question really boils down to whether or not people’s lives and an endless commitment of tax dollars are worth as much as a few minutes or seconds of commute time. This woman, who appears to be heading to the Division of Workforce Services, just finished running across very busy Freedom Blvd with at least three children. Was that a good idea? Obviously not, but she had just arrived on the bus and using the nearest crosswalk would have added another 20 minutes to her trip. That’s an insupportable situation and the design of this street verges on criminal negligence.